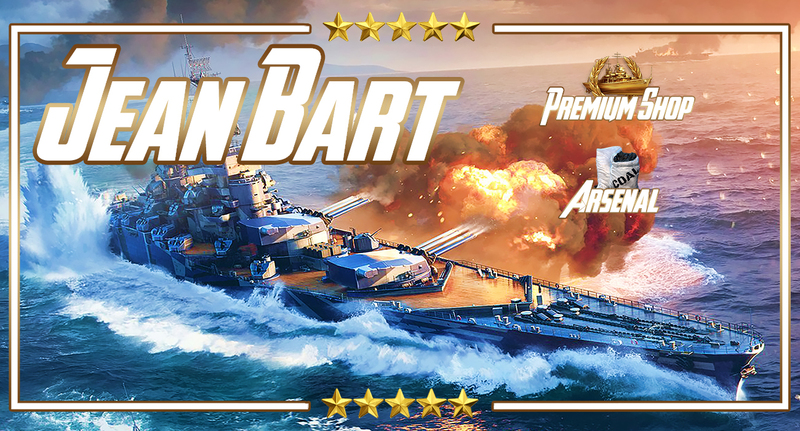 Tier IX French Premium Battleship Jean Bart. Torpedo Damage Reduction - 32%. Main Battery - 2x4 380 mm/45 Mle 1935. Firing range – 24.52 km. Reload time - 26 s.
Maximum dispersion - 306 m.
-HE initial Velocity - 830 m/s. -AP initial velocity - 830 m/s. 12x2 100 mm HE OEA Mle 1945. 3x3 152 mm HE OEA Mle 1937. 14x2 57 mm/60 ACAD Mle 1951. 12x2 100 mm/55 CAD Mle 1945. 3x3 152 mm/55 Mle 1936. Rudder Shift Time: 16 s.
Detectability Firing Main Guns in Smoke: 15.5 km.